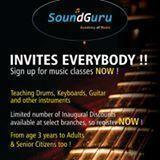 Sound guru Academy of Music..Here to provide quality training in Musical Instruments like Guitar, Drums, Keyboard, etc..
Soundguru Academy of Music conducts classes in Drums, Guitar and Keyboard. It is located in Camp, Pune. It takes Regular Classes- at the Institute.